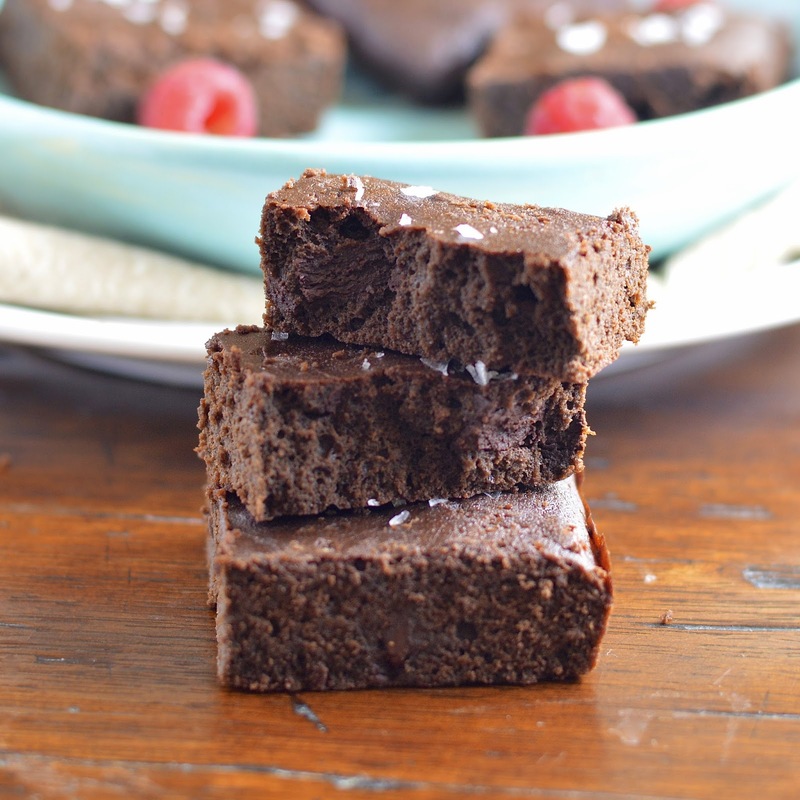 These gluten free double chocolate salted brownies are a decadent indulgence for the chocolate lover in you! It’s been a little over a week since my last post. I have been taking some time to figure out my next step when it comes to my diet. Let me start with a little bit of my health history. From the time I was 20 years old, I have suffered from irritable bowl syndrome (I know, yuck, not exactly cocktail chatter). Over the past 26 years I also have suffered increasingly from muscle pain, especially in my back and neck. I had been to an array of traditional and holistic doctors, who helped manage my ailments, but never quite found out what’s wrong or what was causing my body distress. About four years ago, I additionally started suffering from bad joint pain that seemed unexplainable. After numerous tests, doctor appointments and a ridiculous amount of stress, I was lumped into the fibromyalgia category. I was just happy to receive a diagnosis after weeks of discomfort and anxiety. I started taking a medication that really helped my body pain and was doing OK for a while. I also like to do my own research and found that gluten intolerance often mimics fibromyalgia. For the last few years I have avoided gluten. No bagels, cake, pastries, cookies, etc. I was still eating trace amounts of wheat in ingredients such as soy sauce and I did eat pasta two to three times a week (pasta is the love of my life – the thought of not having it was unbearable!). When my symptoms returned, I started seeing a new holistic rheumatologist who is amazing. After lots of blood work we found I was extremely iron deficient, low in B12, seemed to be fighting a low-grade infection and low/normal thyroid. Most importantly, a saliva test proved that I was very gluten and dairy intolerant. So the first order of business is eliminating these two items from my diet and "cleaning up" my gut. I had already started on the gluten free path but I would require more diligence. The idea of no pasta was horrible. But the dairy! No cheese, milk or yogurt. Ugh, I live on this stuff. Good news - I can have goat or sheep milk and health food stores have a solid selection of these items and I love goat cheese. Today I stocked up on a few more gluten free goodies and I feel ready. I’ll let you know if I see any improvements. I also spent Sunday afternoon whipping up these brownies. I have wanted to bake with coconut flour and this was my first foray. 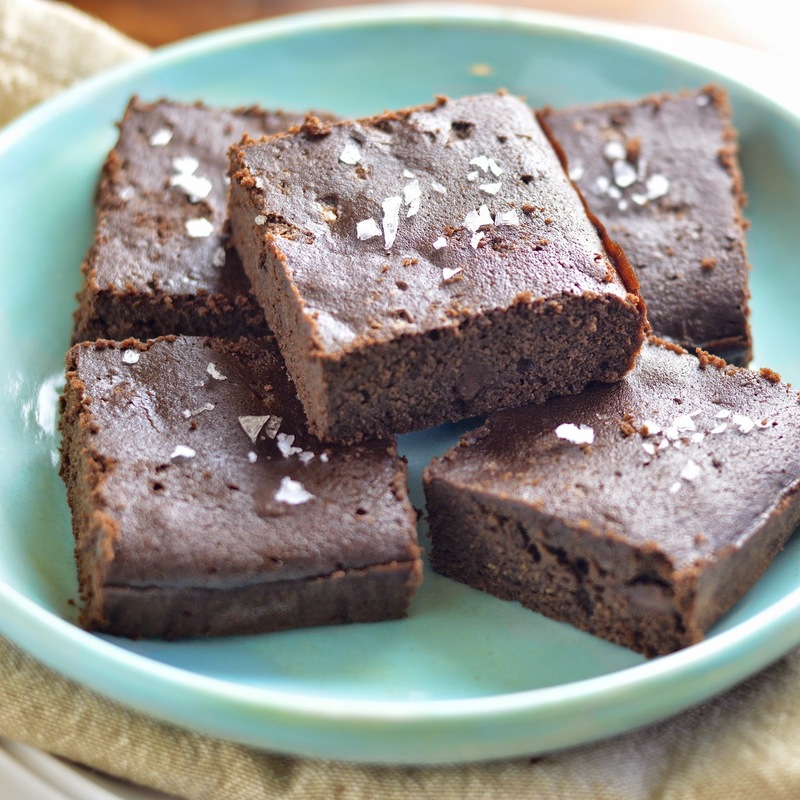 These are incredibly easy to make, fudgy, moist and completely satisfy a sweet tooth. 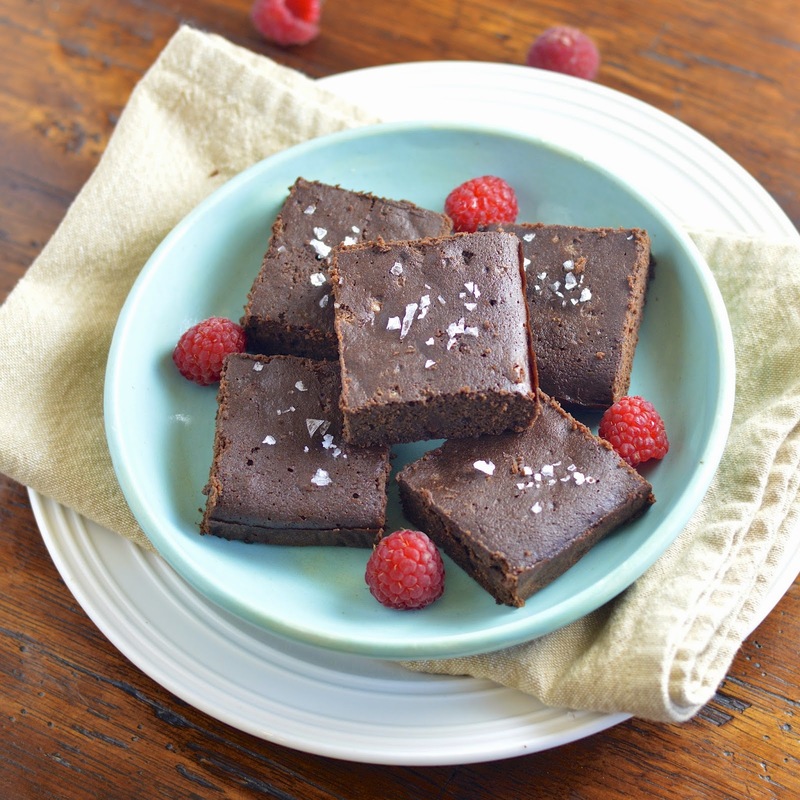 I embellished them with a touch of Maldon sea salt for an extra burst of flavor that makes these cakey squares extra special. Even my kids were digging in and they don’t usually go for the gluten free stuff. 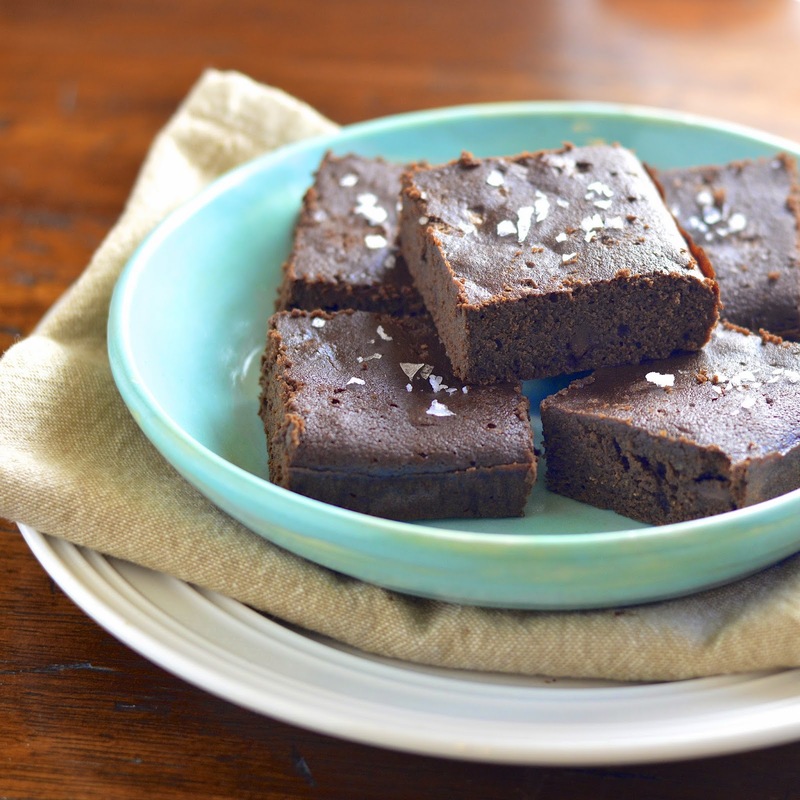 This recipe is based on a brownie creation from Comfy Belly. There are tons of gluten free recipes on Erica's web site and the perfect place to start if you would like to bake with coconut flour. Please share any health or gluten free stories you have in the comments section. I would love to here from you – misery does love company and sometimes it’s nice to feel you are not alone. Lightly grease and then line an 8 inch by 8 inch square baking pan with parchment paper (just the bottom works too). In a medium bowl mix the flour, cocoa and salt with a wire whisk. Add the eggs, honey and vanilla. Beat with an electric mixer until well blended. Add melted butter and beat until thoroughly incorporated and silky. Let sit for 5 minutes and beat again for about 30 seconds. Stir in chocolate. Pour batter into pan and sprinkle with salt evenly. Remove from oven and let cool on a wire rack. Flip the brownies out of the pan and cut into 2 inch by 2 inch squares. Garnish with extra salt if desired.